Growing up, I was always someone who watched TV. Pretty consistently. TV was background noise at my house, and all of us had our favorite shows. It never really occurred to me that all of that TV watching was not only costing money with electricity, but also probably cost a lot of money to have cable. Fast forward to when I got my first apartment in college. We had cable for approximately two months. One at the "deal rate" and then one at the real rate. That got cancelled real fast. Ever since then, I have lived without cable TV. In college with my roommate, when I lived by myself for a short time here in Norfolk, and now that I live with Dave. It has always seemed like such a waste to me, because you really can watch tons and tons of stuff without it. There are many different ways that we watch movies and TV at our apartment, but the basic concept is that we stream content from the internet. We do this with a couple different devices, and then we have a couple different "providers." Internet Provider and Modem- This is crucial if you are going to stream, and watch TV over the internet. I find that it is best to have one step up from a basic internet speed if you are going to stream. Especially if you are going to stream and use the internet at the same time. Roku 3- The main way that we watch anything at our house is on the TV through a Roku device. Dave got this for me for Christmas last year, and it has been amazing. We can stream almost anything we want on it, and it shows on the TV. It costs $99 and is totally worth the investment. Amazon Kindle Fire- I do a lot of streaming on my Kindle Fire. We have an Amazon Prime account, and with that, you have access to all of the Instant Video for free. Before we had the Roku, this was the main way I would watch movies and TV. I still use it when we go on trips, or if I have a long break at work. Laptops- We also do some streaming with our laptops. Each of us have a chromebook, and occasionally we use them to stream content. The benefit of this is that the screens are large. Netflix- We watch the majority of movies, documentaries and TV shows on Netflix. There are always new things being added, and I love that Dave and I can have our own profiles within the same account. Netflix makes it super easy to binge watch TV, and I love it. Amazon Instant Video- I use this a lot on my Kindle, but we also just hooked it up to the Roku. They have a ton of good stuff on here that Netflix doesn't have, including some HBO and Showtime stuff. Yay Amazon! YouTube- This is one that Dave uses a ton for a couple of mini-series. Youtube is free (for the most part) and there is so much amazing content on it. Are you a cable lover? Would you ever think of giving up cable? Don't forget to enter our giveaway to have a chance to win a Kindle Fire HD7 AND $50 to Amazon! Get to watching those movies! If we canceled cable, I'd have to reactivate Hulu Plus! We love our Chromecast and we have a smart TV to stream from Netflix. I'm trying to get Jason to get rid of DirectTV. We watch more Netflix than anything and I'd love to save the money. Thanks for the good ideas! What a great post! I am also cable-free, by choice, and do a lot of the same things you do. oh my gosh, i feel like the whole world of internet streaming tv and movies has finally been decoded for me. thanks so much for all the info! I've been trying to convince my husband that we can get rid of cable and have so much room left in our budget. He's an ESPN fan so that's a no-go. He watches it every morning. I'd still need to know how to watch live Network TV though. We have cable but I rarely have time to watch it. Once my daughter goes to bed the tv is off so I never watch my favorite shows live. We have limited basic cable which is only $22 a month. We only got it so our kids could watch PBS without having to stream it. Before we had kids we just used an antenna, but we were never able to pick up PBS. I stumbled across your blog recently and I adore it! 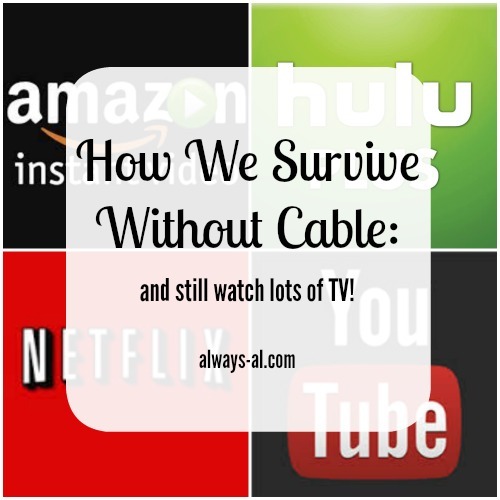 My husband and I don't have cable, but we have netflix, amazon prime and hulu plus. We actually only pay for hulu plus and share the account with our friends, who pay for the netflix and share with us. It cuts down on cost even more because we are only paying for two subscriptions instead of three! We actually share a Hulu Plus account with our friends. I hardly ever use that a lot though, so I left it off. What are the benefits? Any time! Seriously the only time we miss it is when you might want to watch the news or the weather, but all that stuff you can watch online now. Haha! You're welcome! Thanks for visiting! Yeah, that's the downfall. My fiance watches a lot of baseball, and he has the MLB package with his family. You can get a box from your local cable company for a really small fee that will let you watch the network channels, we just don't have one. That sounds reasonable! The basic cable package where I live was ridiculous, so we chose to not pick it up. We don't have kids, but I think it would be different if we did. Aww thank you! We share our Hulu plus account with our friends, and we pay for the Netflix and share with my family. We use Amazon prime so much for shipping that it makes it worth it. I think with all the streaming options out now, not having cable is totally doable. It has the current season and usually episodes the day after they air!